We’ve seen many of these structures, and wondered about them. Discovered the answer on our second day of travels among the Åland islands. Midsummer is a serious holiday and celebration time here. Our host at the Stellhagen Brewery said they only close for Christmas, New Year’s Day, and Midsummer. The spar, which is usually made of spruce, should be felled in winter. 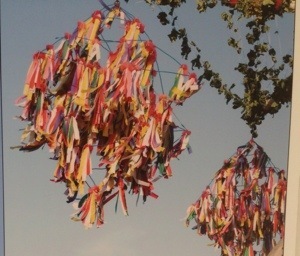 The poles used to be unpainted, but nowadays they are often whitewashed and in some cases adorned with painted-on garlands, or wrapped garland or ribbon of different colors. Leafy bunches of vegetation adorn the spar in the form of wreaths or other decorative gatherings attached to or around the spar. The height of the spar varies between 10 and 25 meters. The pole has a number of crossbars, which are attached horizontally. The ends of the crossbars are adorned with the tops of young spruces, small flags or tassel pins. Sometimes there are also wreaths or leafy branches tied to the ends of the crossbars. Modern midsummer poles are secured in a flag pole base. The archipelago poles that usually are raised on a rocky surface are additionally secured with steel cables. The crown has been interpreted as a symbol for virginity and symbolizes hope for youth, health, and a joyful future. The crown framework was originally made of reeds decorated with colorful tufts of rags, dyed wool, ruffled newspaper, and other showy and colorful materials, today, the frame is usually made of steel pipes, wire, or wooden pins, these are decorated with cut and crinkled crepe or tissue paper,masses, bows, and ribbons in different colors. Some non-woven fabrics are also sometimes used. 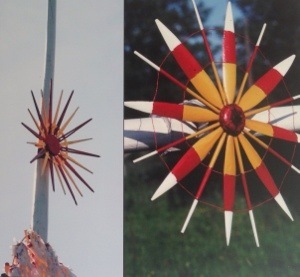 Most midsummer poles are decorated with a sun, the rear of which has a weathercock formed as a rooster, a fish, an oar blade, or something similar. The sun symbolizes the life-giving heat that causes everything to grow, the rooster or fish behind the sun is said to represent agriculture or fishing, respectively. The suns are most common on midsummer poles on the m win island, but can also be seen in the archipelago. 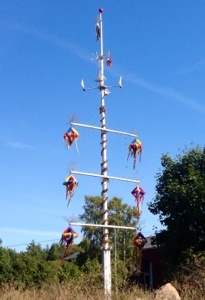 On top of the midsummer pole stands the Fäktargubbe, with his long flat arms waving in the wind. Some of the men wear a cap, others a hat, and sometimes they are smoking a pipe. The Fäktargubbe has many different names: fäktmästare, viftargrubbe, sprattelgrubbe, etc. 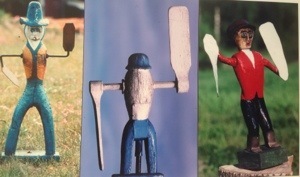 It has been said that “he fences for a good crop,” and that he symbolizes the diligence of Åland.